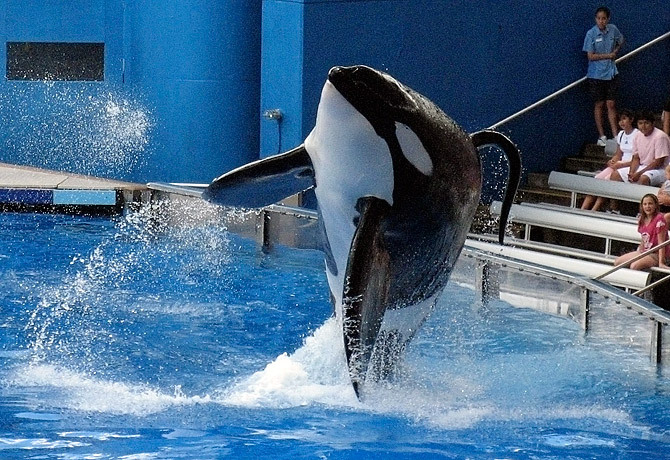 SeaWorld has been embroiled in a battle with the Occupational Safety and Health Administration ever since a trainer, Dawn Brancheau, was killed by a male orca named Tilikum in February, 2010. In the immediate aftermath of the tragedy, “Tili” was placed in solitary confinement, and the Orange County (Florida) Sheriff’s Office initiated their own investigation – one which People for the Ethical Treatment of Animals called “inept and inadequate”. Six months after her death, OSHA, armed with a remarkably detailed and thoroughly researched document from PETA, concluded that SeaWorld was culpable, and fined them $75,000 for a “willful” safety violation by “exposing its employees to struck-by and drowning hazards when interacting with killer whales.” The theme park appealed the ruling and the case was heard by Administrative Law Judge Kenneth S. Welsch who concurred with the decision by OSHA regarding the citations, but reduced the amount of the fines to $12,000 after changing the safety violation from “willful” to “serious”. SeaWorld is now requesting that OSHA’s Review Commission take a second look at the agency’s decision, particularly regarding the rule that prohibits trainers from performing with the giant mammals without a physical barrier between them. In other words, the trainers can no longer swim with or give cues and signals to the whales from inside the pool performance area at Shamu Stadium. They will be allowed, however, to attend to their medical and other needs. Needless to say, park officials are both angered and frustrated by the order. Anyone who has ever visited SeaWorld knows that the performances by the whales in harmony with their trainers is the biggest draw. It is what tourists from all over the world come to see – people interacting with 4 to 6 ton whales who appear to be as comfortable with the relationship as the family dog – and that is what OSHA sees as the crux of the problem. It’s also managed to resurrect the debate over whether these animals should be held in captivity at all, never mind be trained to perform. They’re wild animals and any contact with a wild animal, trained or not, is inherently dangerous. OSHA says that SeaWorld didn’t do enough to protect their employees from the dangers that come with working alongside the whales. PETA, The Animal Legal Defense Fund and the Earth Island Institute’s International Marine Mammal Project think that all of the whales should be returned to their natural habitat. In fact, it was the latter group which was responsible for rescuing, rehabilitating and releasing the killer whale, Keiko, whose story was told in the movie “Free Willy”. While “Free Willy”, the movie, may have been a heartwarming story of a wild creature being released to live a life it was supposed to have, Keiko’s reality was much different. The success of the film prompted a letter writing campaign from the public which, together with the efforts of the Free Willy/Keiko Foundation, brought about the orca’s move to the waters off of Iceland where Keiko was born. For two years, a team of scientists trained Keiko to follow boats farther out into the ocean in the hopes and belief that he would eventually join a pod and live out his days as a free whale. Even then, the whale would simply float on the surface, glancing at the pods from hundreds of meters away. He wanted human contact and followed the boats, rather than the other whales. Keiko finally migrated to Norway, still seeking the company of humans. He could be seen, daily, staying near a small boat, almost entirely inactive – leading some to think that he had determined that these people and their boat were his pod. The fact that he was famous didn’t help at all. People would gather in a nearby cove, hoping to touch him or feed him, something which his caretakers strictly forbade. Their efforts were futile, however, as the crowds simply swam up to pet him and just be near him. The orca finally died, only a year after his migration and five years after his release, from pneumonia, very possibly contracted through all of the attention lavished on him by his human fan club. This is the dilemma that faces not only SeaWorld, but every park, zoo or aquarium in the world. Some of the whales at SeaWorld were caught and brought to the various parks when they about 2 years old. They have lived as wild animals in domestic care for decades. Some of them have become sick, depressed, aggressive or all of the above. Reports from the day Tilikum attacked his trainer indicate that he and another male had been chasing each other around the pool – not playfully, but with what appeared to be a show of aggression. If that’s true, then those signs shouldn’t have been ignored. I know that it’s not a good idea for me to saddle up and ride off into the sunset when our geldings are in the midst of a dispute. Their focus and attention are on other matters, and ignoring this type of behavior is a surefire way to get hurt. Then again, I’m not under the pressures of a theme park, the management of which has determined that the show must go on. The owners and representatives of SeaWorld defend both the ongoing captivity of the whales and the importance of their performances with the trainers in close contact. They say that they provide millions of people with the opportunity to see, up close, animals they may never be able to see anywhere else. The performance aspect is a way of demonstrating the intelligence of the whales, as well as proving that humans and wild animals can form a bond, just as Tilikum and Dawn had done. There’s some merit to that argument. Awareness of all kinds of animals can bring about interest in their natural environments, their need for protection and a duty to see to it that they are not destroyed. The whales, as is the case for most captive animals, have become education and conservation ambassadors. The shame of it is that these behemoths are living in pools much too small for their needs – which one critic described as putting a goldfish in a teacup. Maybe OSHA and the judge have found a way to solve a bigger problem than just the safety of the trainers, even though it wasn’t what they had intended to do. It’s a compromise of sorts, with the whales and trainers still performing, but in a much safer environment. The public can still see that the animals are smart as hell and can, in fact, care about, listen and respond to cues from humans. The whales at SeaWorld, and other animal parks, will, more than likely, never be returned to the wild. Given Keiko’s story, it’s a long shot that it would be successful anyway. It’s too bad that OSHA doesn’t have a division which considers the needs of the non-human employees. Hopefully, someone else is working out a way to get these graceful and noble creatures more suitable and size-worthy accommodations for their off-duty hours. In the meantime, they’ll be doing the work they were trained to do, everyday, without anyone to hear their complaints. References: The United States Department of Labor, OSHA, peta.org, The Orca Project, The Christian Science Monitor, The Orlando Sentinel, newscientist.com and digitaljournal.com. Some other souces of information were excerpts, courtesy of The Huffington Post, from the book “Death at SeaWorld” by David Kirby, to be released July 17, 2012. This entry was posted in In The News and tagged Dawn Brancheau, Keiko, killer whales, orcas, OSHA, SeaWorld, Tilikum. Bookmark the permalink. My husband and I watched a documentary about how they are captured. It was bloody and heartbreaking. If I can remember the name of it I will post it here. Just remembered: “The Cove”. I highly recommend watching this documentary. As a child I was delighted by whale and dolphin shows. Now I am horrified. The enslavement of wild animals for our entertainment is barbaric. I would love to see all of the millionaires and celebs that back PETA pool their resources to buy Sea World & Barnum and simply shut them down. We need retirement facilites for these professional slaves. Wonderful post Empress. I’m happy that humans are understanding that these beings are in fact our mammalian cousins. They are more closely related to us than previous human generations ever thought. They, too, are our family members. I swam with dolphins and saw that each had their own unique personality, just as my family members and house pets have had. The dolphins I swam with weren’t captive. They were free to come and go into the open ocean as they pleased. They appeared to appreciate an easy meal and then off to explore, much like the sandhill cranes and other birds come for the birdseed that I place outside. I hope all was as it was represented.